Photo and Text by Lindsey Johnson for Design Mom. This is another basic for our Lunch Menu #6 — turkey and swiss on whole wheat bread. 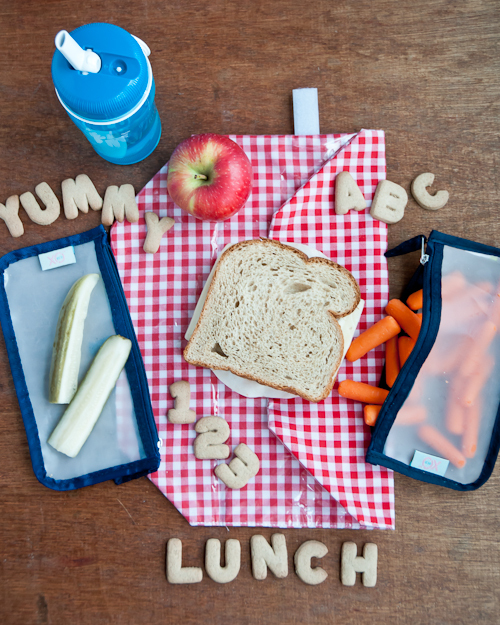 I’m still a fan of basic lunches because they always get eaten up and my kids love them. I do want to highlight this super cool Wrap-N-Mat. It functions as a reusable sandwich wrap, but also as a place mat. I love it! It’s super easy for kids to use and fold up and fastens with velcro. – The pickles are a fun thing to add, but can be messy. I drain them well first so pickle juice doesn’t leak onto the other lunch items. They seem to be fine until lunch time. I was at the market two times this weekend and still forgot to buy bread for sandwiches! Who does that?! The boyz had to take bagel sandwiches today. I’m loving your Lunch Menu series! I recently started a school lunch blog (www.kidslunchbox.co.uk) over here in the UK, I love your ideas, photography, and the way you set up the image. I have a lot to learn! We love Wrap-n-Mat!! I started using them when my children were in preschool and now even on up into grade school, they have held up so well! I’ve also found they work well for gifts…my adult friends love them :). Have you tried the thermos brand metal thermos with straw for kids they are our favorite! We found ours at Target! Not sure about the zippered pouches. Especially not for fruits,it is probably more like fruit juice by lunchtime. For thermos, try the brand SIGG. Durable, easy to use and many cute designs. We are LOVING these posts!